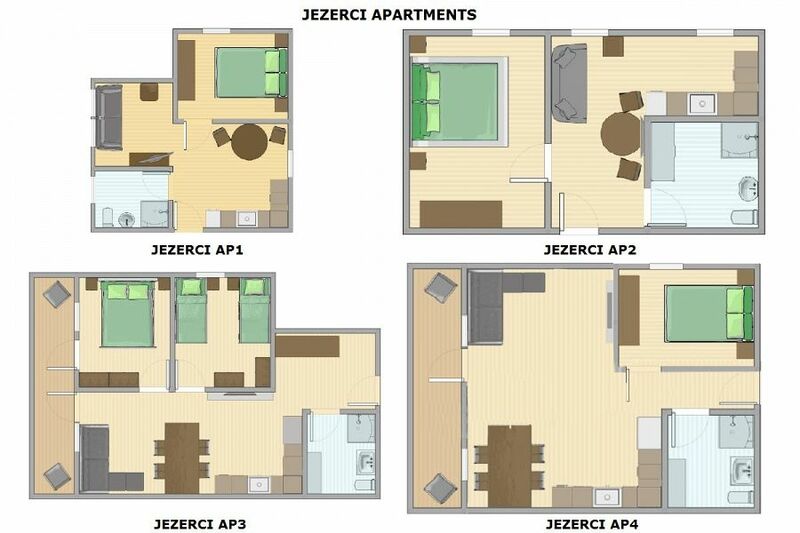 Jezerci Apartments offer excellently located Bled accommodation at the foot of Straa hill in a quiet, prestigious residential area with spread out buildings, low traffic levals and some beautiful period villas, just a 500m walk from Lake Bled promenade (the Grand Hotel Toplice area) and 5 minutes walk to the centre of Bled town offering a wide range of restaurants, bars and other amenities. It is also just a few minutes walk to the bottom of Straza hill where there is a Summer sledging piste and adrenalin park and skiing in Winter when snow conditions allow. The excellent pool and spa facilities of Hotel Golf are just 300m away. Walking in the other direction away from the Lake, it is a few minutes walk to come to stunning views of the Karavanke mountains and access a wonderful walk to the far end of Lake Bled via the charming scenery of Selo village behind Straza hill. 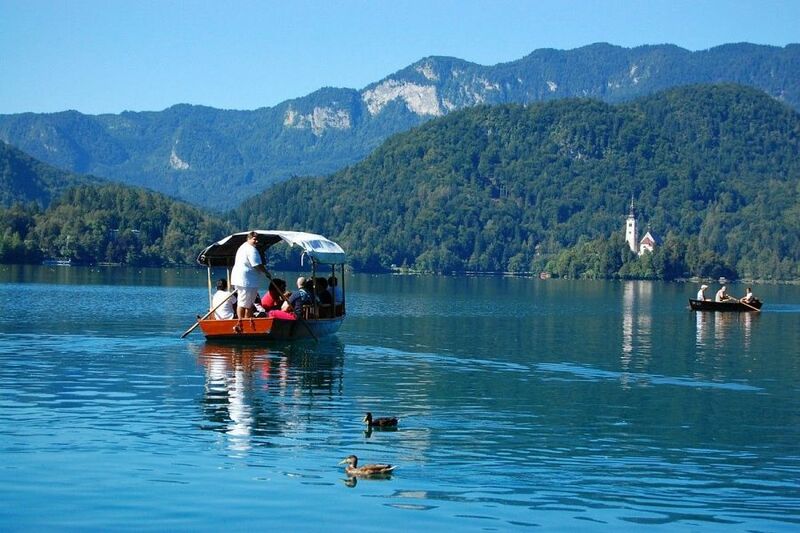 Lake Bled itself is a stunning alpine lake, surrounded by mountains, famous for its impossibly picturesque 17th century church on an island overlooked by a medieval castle and was named by Yahoo Travel as one of the World's 10 Most Beautiful Lakes. 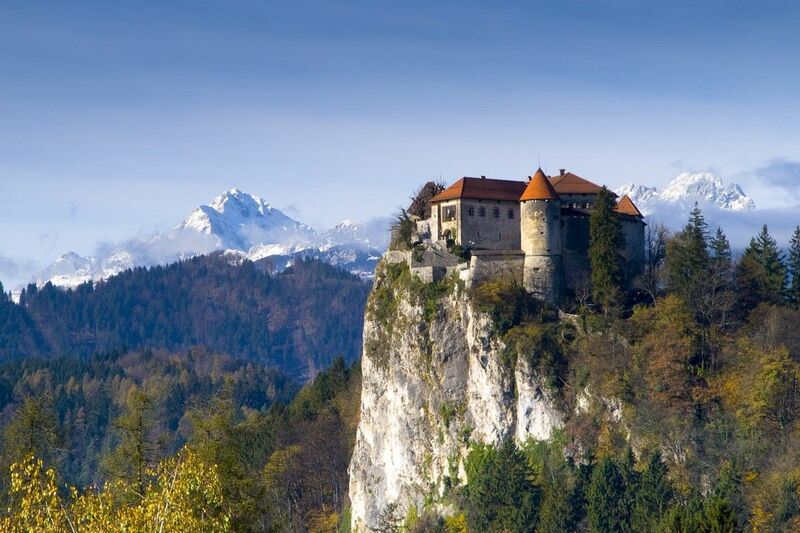 The Bled area is surrounded by beautiful scenery and things to do from walks around the lovely Vintgar Gorge and various hills surrounding the lake to great mountain walking and mountain biking on the Pokljuka Plateau, kayaking, canyoning and rafting on the Sava Bohinjka River and its tributaries, as well of course as swimming and boating on Lake Bled itself. Bled is also a great place to be based for exploring Slovenia's many ski areas - there is a small resort in the town itself but most skiers based in Bled visit the excellent resorts of Vogel, Krvavec & Kranjska Gora which are each half an hour's drive away (or there is a ski bus from Bled to Vogel / Krvavec). 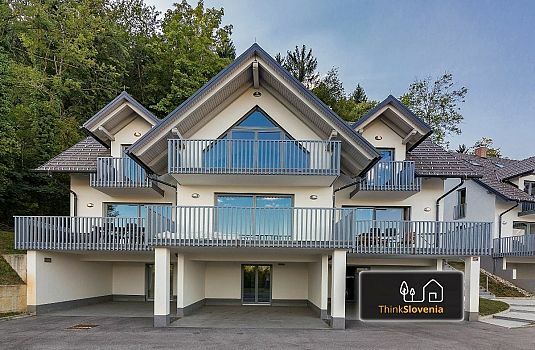 There is a wide range of other ski areas in Slovenia / Italy / Austria within day trip distance from the property. Please click for a ski resort guide. Train The nearest train station is cca 3km away at Lesce Bled. Spacious one bedroom apartment measuring circa 50m2 and consists of open plan living room with comfortable sofa, dining area and fully equipped kitchen with 4 ring stove, microwave oven, fridge with freezer compartment, toaster, kettle, cutlery & crockery. There is one double bedroom. 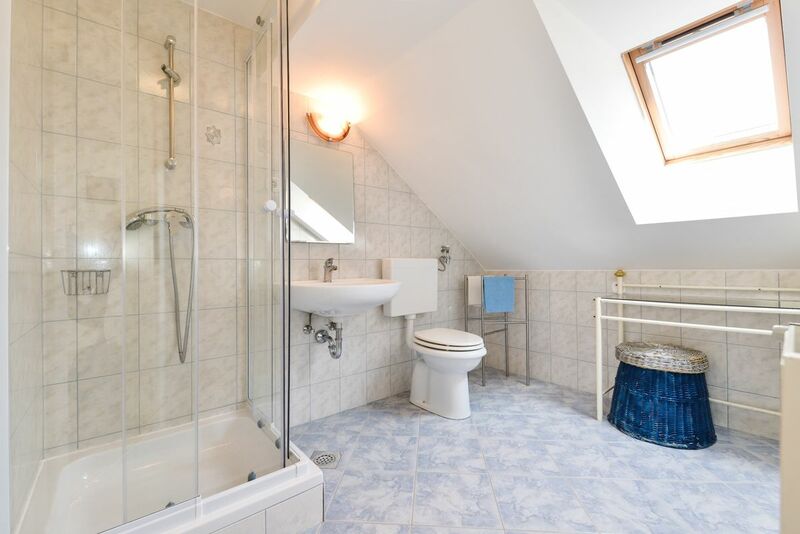 Spacious bathroom with shower. 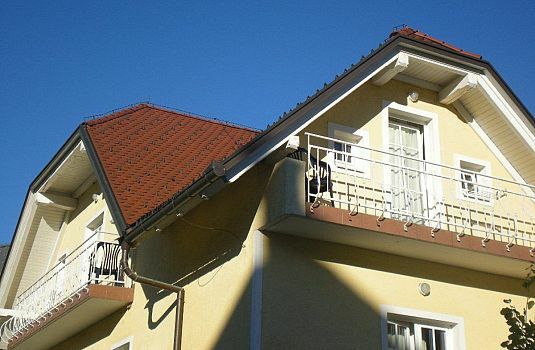 In addition there is a Cable TV & internet. All apartments have one on-site parking space and access to the beautiful shared garden area with BBQ and views of the Karavanke mountains. Apartment 1 is located on the first floor of the building. Bathroom notes A clean functional modern bathroom with shower enclosure. 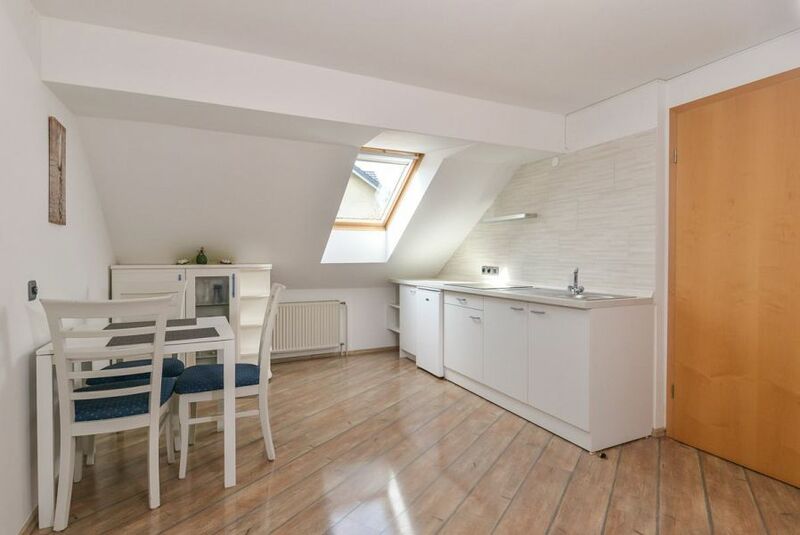 Kitchen in the apartment is modern and functional, designed for holiday use rather than offering all the appliances that you might expect at home. 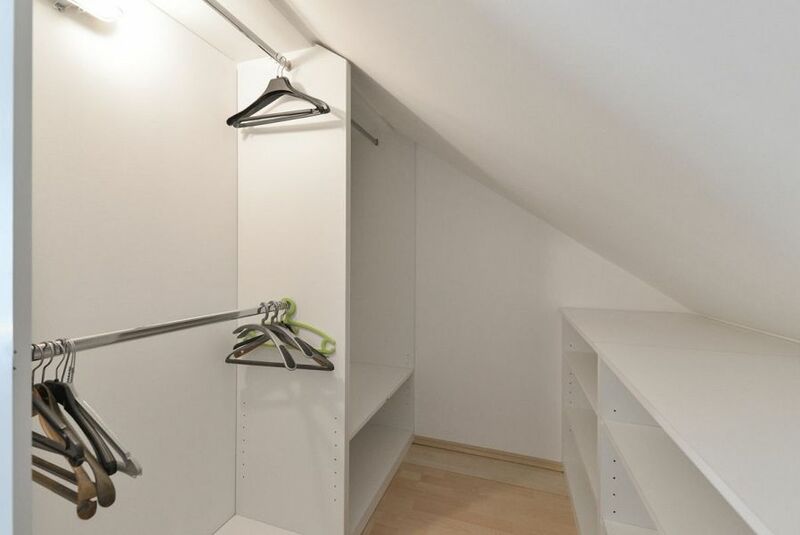 It has a fridge with freezer compartment, microwave oven, cooking hob & kettle. Living room Open plan living room / kitchen / diner. 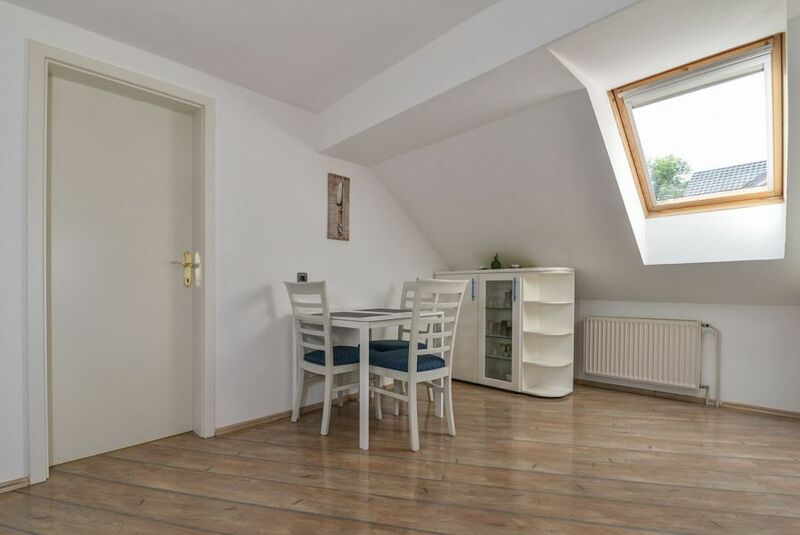 Dining room / area Open plan living room / kitchen / diner with seating relevant to the size of the apartment. Garden / outside space Good sized garden with garden furniture and BBQ, shared between all apartments. Parking Parking at the front of the house - 1 space per apartment. 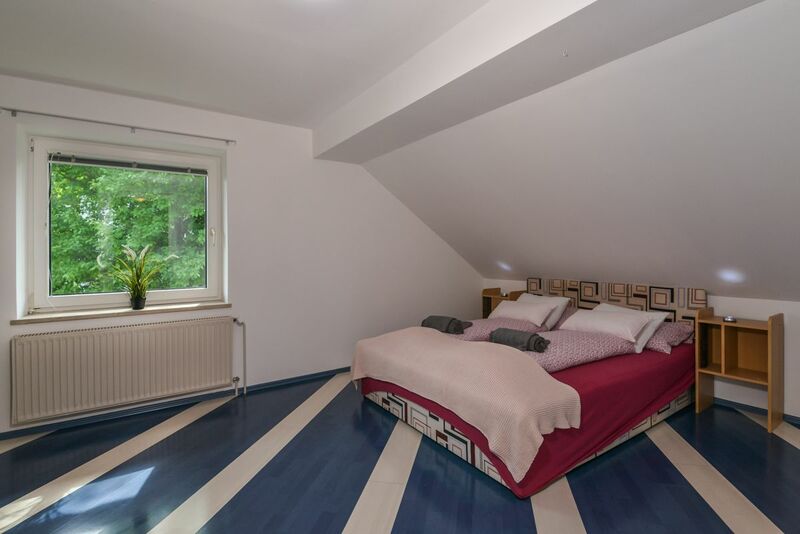 Jezerci apartment 1 is a wonderfully located alpine building 500m walk from Lake Bled promenade in a quiet residential area with shared garden with great views towards the Karavanke Alps. 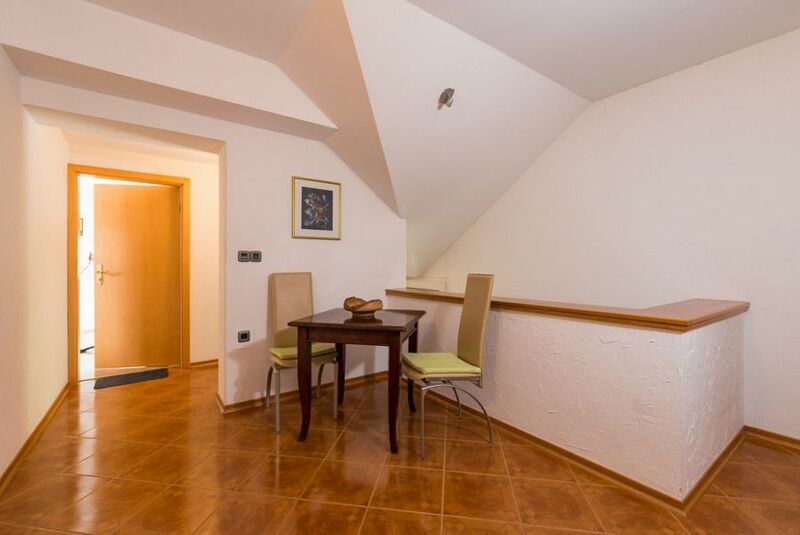 It is 5 minutes walk from the apartment to the center of Bled town and its restaurants, bars, shops and amenities. 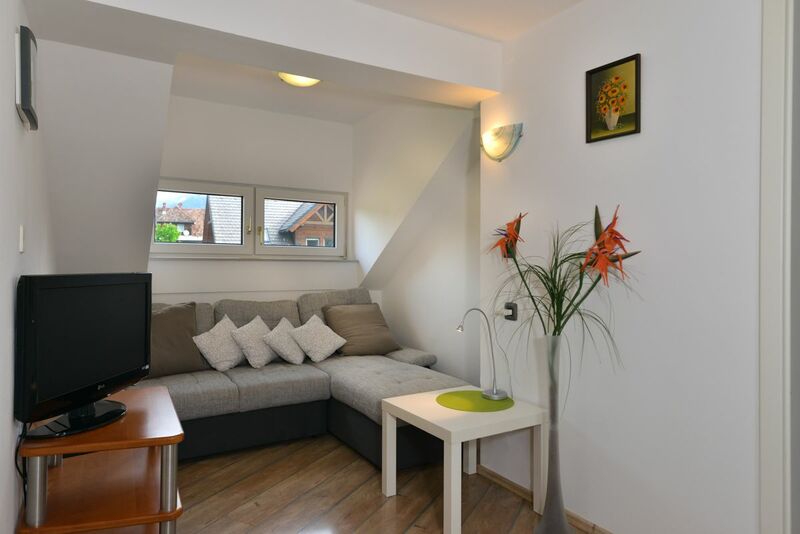 Apartment 1 is a 1 bedroom apartment (with double bed) for up to 3 guests. 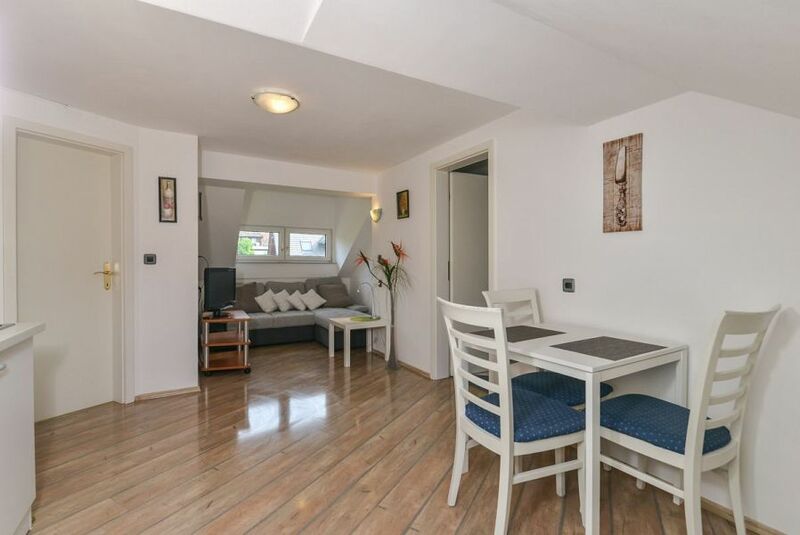 The attractive garden with BBQ area is shared by the four apartments and is a great place to relax in the evenings. 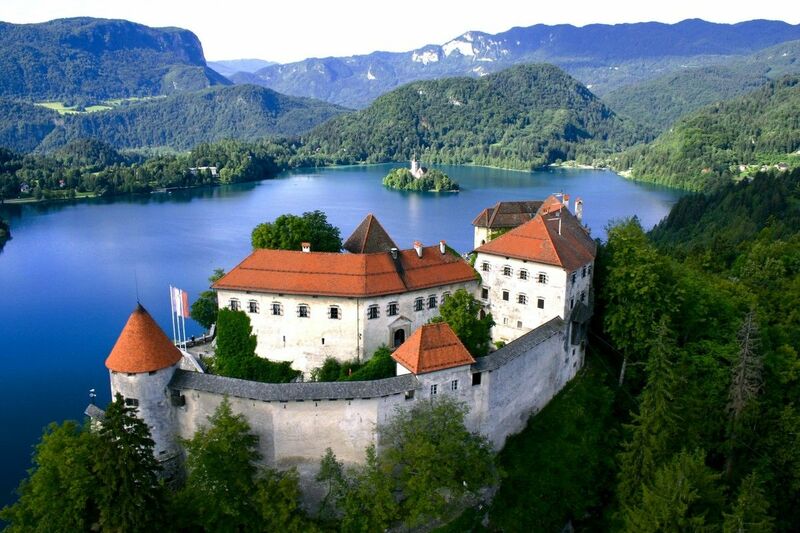 Lake Bled itself is a stunning alpine lake, named by Yahoo Travel as one of the World's 10 Most Beautiful Lakes, surrounded by mountains, overlooked by a medieval castle. 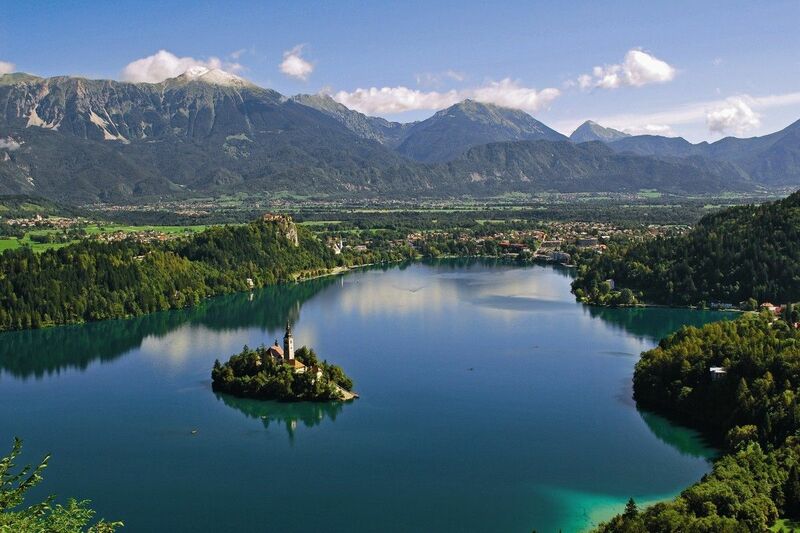 The Bled area is surrounded by beautiful scenery and things to do from walks around the lovely Vintgar Gorge and various hills surrounding the lake to great mountain walking and mountain biking on the Pokljuka Plateau, kayaking, canyoning and rafting on the Sava Bohinjka River and its tributaries, as well of course as swimming and boating on Lake Bled itself. 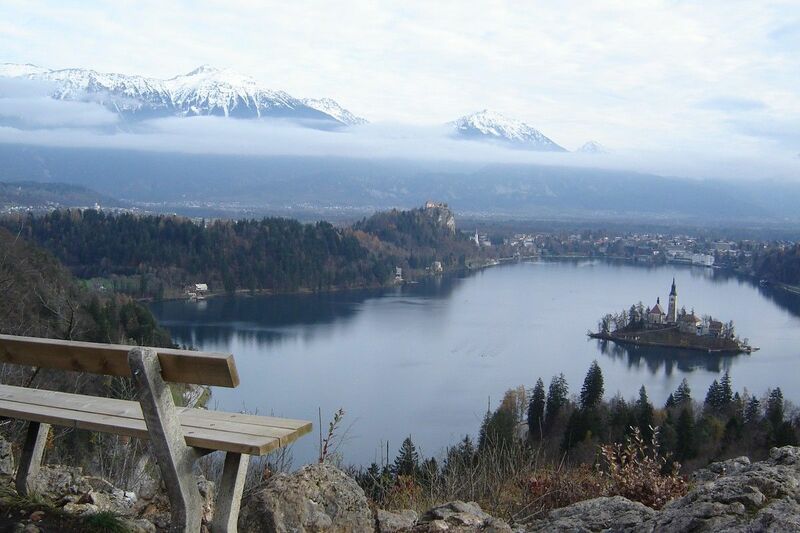 Bled is also a great place to be based for exploring Slovenia's many ski areas and visiting Slovenia’s many sights with plenty of easy day trips possible including Lake Bohinj, Ljubljana and the medieval town of Skofja Loka. 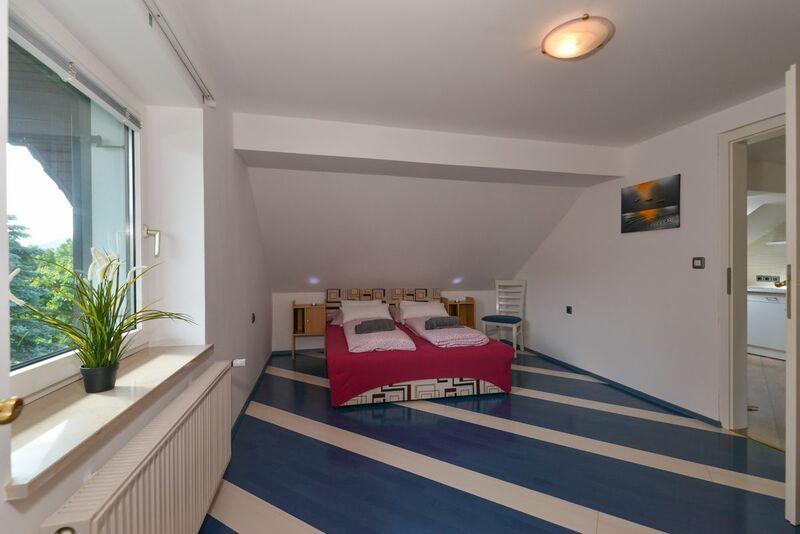 There is a wide range of other ski areas in Slovenia / Italy / Austria within day trip distance from the property. Please click for a ski resort guide. 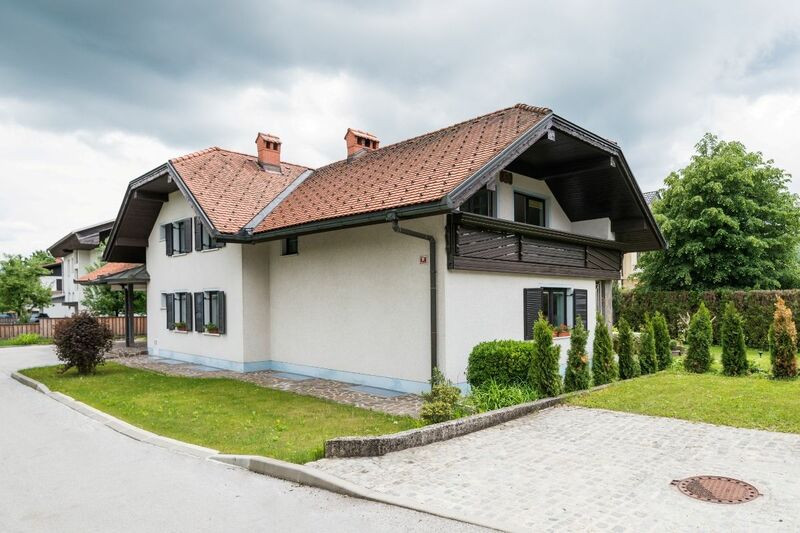 One bedroom apartment in a wonderfully located alpine building 500m walk from Lake Bled promenade in a quiet residential area with shared garden with great views towards the Karavanke Alps. 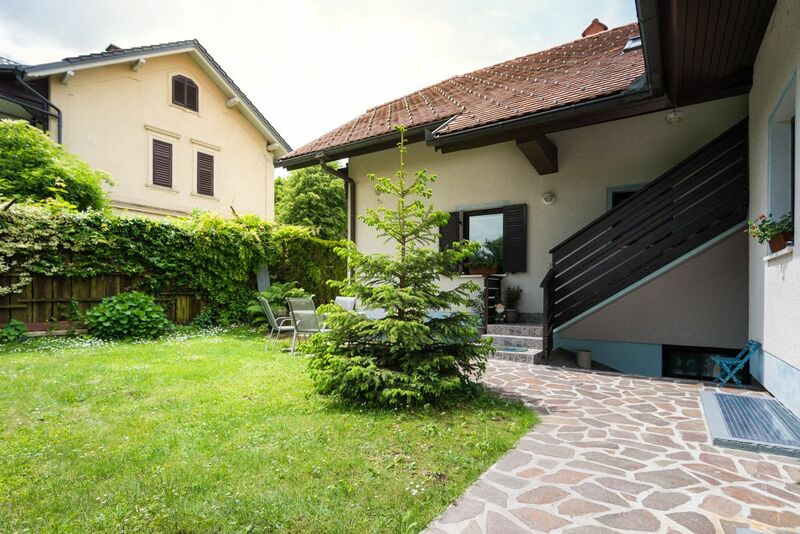 It is 5 minutes walk from the apartment to the center of Bled town and its restaurants, bars, shops and amenities.? Two bedroom apartment in a wonderfully located alpine building 500m walk from Lake Bled promenade in a quiet residential area with shared garden with great views towards the Karavanke Alps. 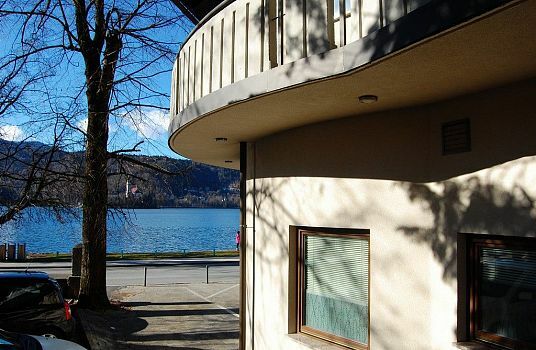 It is 5 minutes walk from the apartment to the center of Bled town and its restaurants, bars, shops and amenities. ?